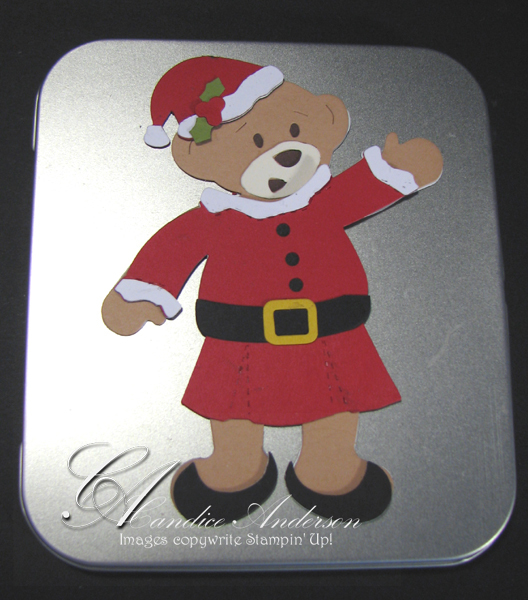 The Stampin’ Santa gave to you a Magnetic Build a Bear Santa Claus. I love our Build a Bear Line. We have fun stamp sets, paper as well as dies for the Big Shot. Plus here’s a little secret. These items will be around for a while. They are listed in the new mini catalog as well along with several fun new ones. The Big Shot dies are so much fun. Here I cut the bear out of Magnet as well as the clothes so they could be changed anytime, just like paper dolls. The best part is they are bears so they appeal to both boys and girls and you can dress them up in both boys and girls. You can find these silver skinny tins in our Clearance Section on-line. They are while supplies last so hurry fast. They are great because you can store all your pieces inside and create your bear on the outside. They make a great traveling gift for kids. If you would love to see more of this product in action let me know. I’d love to do a Build-A-Bear Party. You can find more info. on these products in our mini catalog.